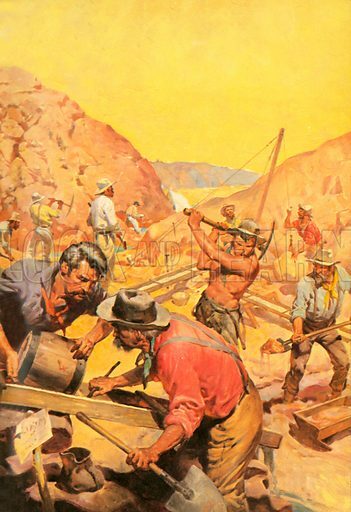 The first and greatest gold strike took place in California in 1848, just at the time when California was ceded to the United States by Mexico. James Marshall found gold near the sawmill of John Augustus Sutter on the American River. He and Sutter tried to keep their find a secret, but soon afterwards, a man ran through the tiny village of San Francisco shouting: “Gold! Gold! Gold from the American River!” The rush was on. At first it was a local affair. The crews of all the ships in the area headed for the hills, hard on the heels of practically the entire male population. “All were off to the mines, some on carts, some on horses, some on crutches, and one went in a litter,” wrote a Californian. There were incredible finds, including lumps of pure gold as big as a football. The news spread. Ships sailed round the Horn from New York and Britain. Intrepid expeditions went the short, fever-ridden way overland across Panama (before there was a canal). Some risked dying of exhaustion and thirst – and from Indian attacks – as they trekked across the Great Plains and through the Rockies to the goldfields. It was now 1849 – and the ‘Forty-Niners’, as the miners were later called, were on their way! The population of California soared. In 1848, it was less than 20,000; in 1852, the boom year, when 81 million dollars-worth of gold was discovered, it had swollen to a quarter of a million. By 1900, well over a thousand million dollars-worth of gold had been extracted! Finding gold was sheer luck. A few of the prospectors became rich, but richest of all were the financiers and some of the tradespeople and railroad builders who arrived soon after the prospectors. Some miners never made a single strike in years of prospecting, and many were robbed or killed. Law and order were non-existent at first: it was the “Wild West” with a vengeance. Yet the California Gold Rush was one of the greatest events of the age. It made the United States suddenly and fantastically rich, and it helped populate and open up the West. Gold fever spelt national prosperity. The mining boom moved inland. Colorado, Nevada, Montana and other states and territories all had their “rushes”. It was a gold rush into the sacred Black Hills of the Sioux Indians that resulted, a few years later, in General George Custer and his entire command being wiped out at the Little Bighorn in 1876. Australia’s gold rushes started in the 1850s – and at first conditions in the gold fields there were as wild as in California. New Zealand’s rush began in 1861. South Africa, which now produced half the world’s gold, had its own stampedes, from the 1880s onwards. The century ended with another gold rush. This was in the fabulous Klondike region of North-West Canada and Alaska, and was therefore a Canadian and a United States gold rush. Thanks to the Royal Canadian Mounted Police, the miners’ behaviour was better than that of miners elsewhere! Gold was first found in the Klondike in 1896, and the stampede began in 1897. Over 30,000 men arrived there. It was a rough journey – up the Yukon River or across the high Alaskan passes. Supplies had to be carried on the prospectors’ backs. Many men were not properly equipped and froze to death. Again the storekeepers became richer than many of the miners. But some of the prospectors were lucky, and by 1900 nine million pounds-worth of gold had been brought out of the territory. Nowadays, gold-mining is a highly technical business. There is little hope of finding gold “lying around”. It is a far cry from the stirring days when anyone could join a stampede and – if he was lucky – become a millionaire.